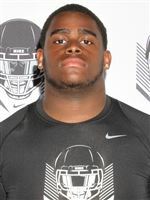 Owls Add Lineman from DeKalb Co.
Kennesaw State Football has gotten a commitment from OL/DL Terrell Paxton (2018) following this past weekend’s Official Visit. Paxton could play on either side of the ball, but as of now, it seems OL is more likely. Norcross Guard Gets an Offer! Abdur-Rahim Offers Another GA Baller! Owls Add Defensive Back from Kennesaw!